Hey everyone! 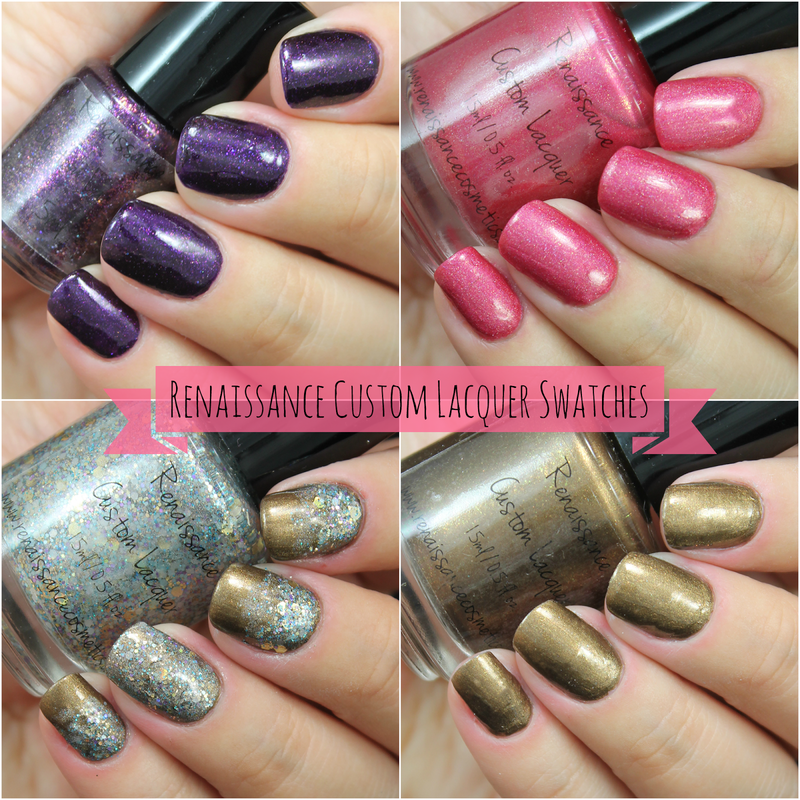 As you all know, if you read my last post, I had the honor in guest posting at Renaissance Cosmetics lacquer's blog (you can check for the post here). So today I wanted to show you four swatches of the beautiful polishes. I am loving these polishes and have been itching to try them. The creator of this brand is, none other than Canadian nail art blogger, Meghan from Will Paint Nails for Food along with her sister Laura. They aim to create beautiful and unique shades with vibrant glitters and shimmers. 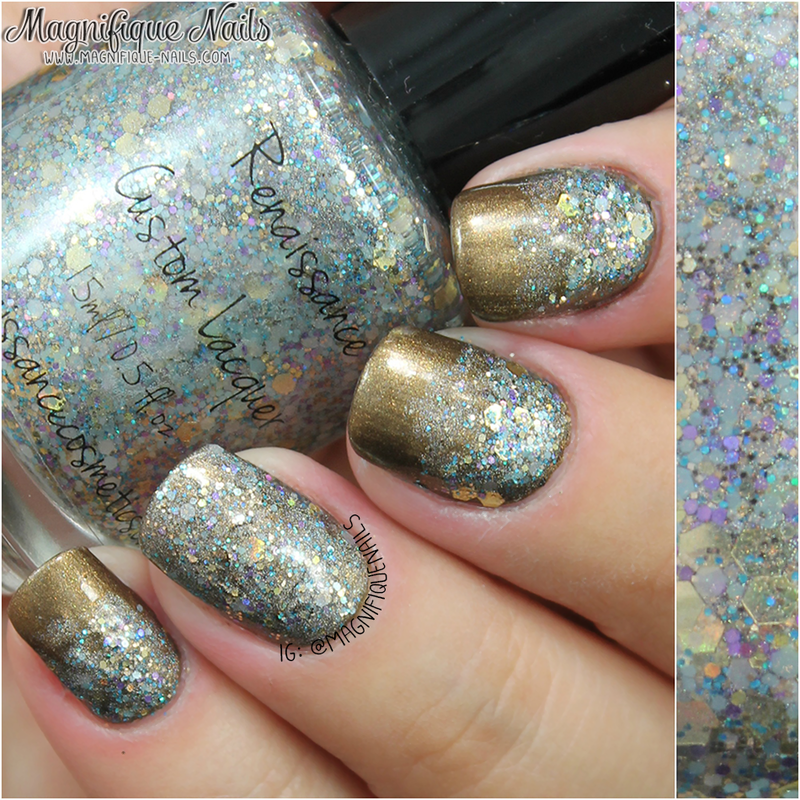 Taffeta Gown- is a gorgeous pink shade with tons of holographic and gold shimmers, throughout the polish. I absolutely love it! I mean who's doesn't love shimmers on their polishes?! I know I do! When captured under the light the shimmers and pink shade stands out, which can also vary in color. You can definitely get away with one coat, but shown I applied two coats and sealed with top coat. Enamoured- is a stunning dark royal purple filled with holographic shimmers and iridescent flakes, throughout the polish. Such a perfect color to represent the color of the year, even though its on the darker side, its a must have in your purple collection. This is two coats and required a coat of top coat for that glossy finish. Other than that, on it's own has a matted finish. Spadina- I absolutely love this color! 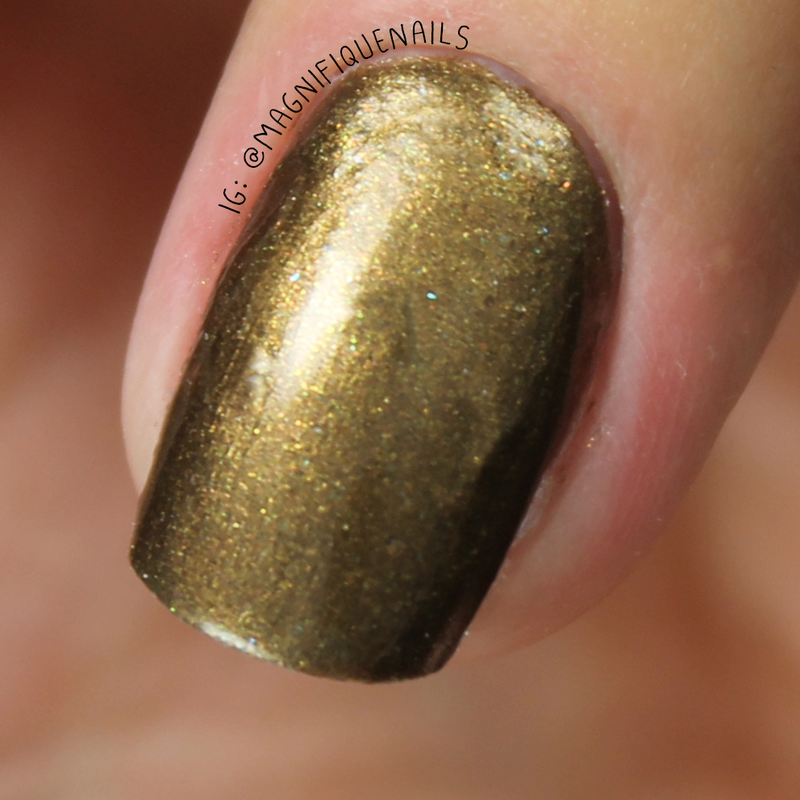 This is a unique gold polish with some golden/holographic shimmers and bronze or brownish undertones. I can definitely say, I haven't seen any polish out their with this shade, and I have tons of gold polishes to compare. The formula and application was amazing. This is two coats, sealed with top coat. Crystalline- Okay this has to be my utmost favorite glitter polish out there! Not only was the colors captivating, I was pleasantly surprised the amount of glitters it had. It is filled with tons of holographic shimmers and purple, gold, blue hex/ round glitters and snowflakes. This is one coat...yes one coat over Spadina, sealed with top coat. I love the contrast of gold and this glitter together. Overall, I'm utterly impressed by the formula on all of the polishes. Especially, since they all have tons of shimmers and glitters included. 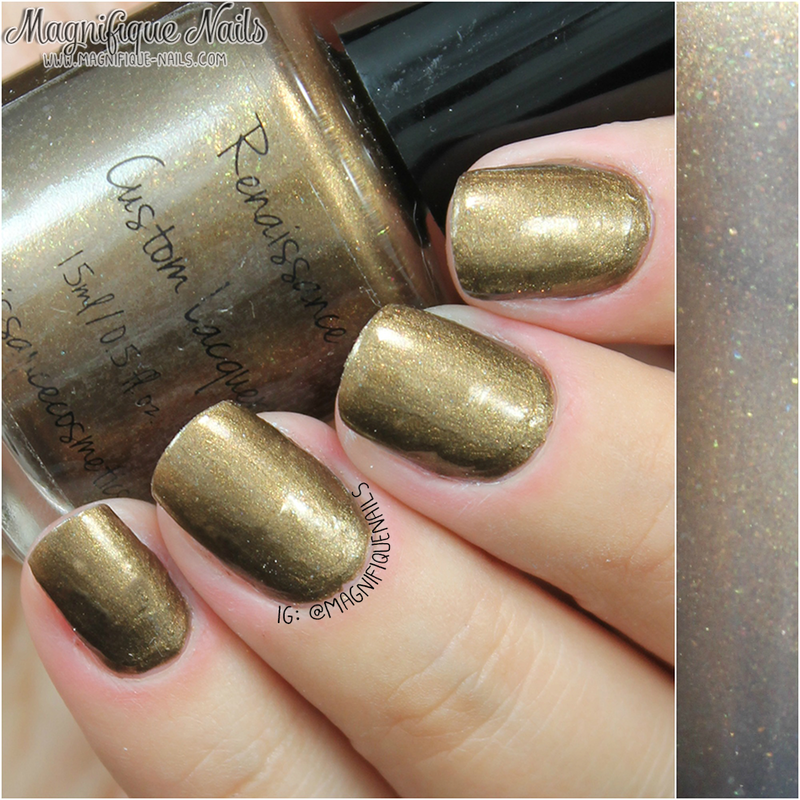 Sometimes polishes like these (specifically indies) can have very thick and the application can be rough, but not Renaissance Cosmetics (and I'm not just saying that)! ;) It was super easy to apply and I loved how some can be one coaters! I also can't forgot their cuticle oil. It's actually my first "indie" cuticle oil I ever tried, and it's amazing! I was a little hesitant at first, but I loved the smell Mandarin. As I applied around my cuticles, it reminded me of my Essie and CND cuticle oils and how soft my skin felt. You can purchase their polishes here on their site for $9.50 (Crystalline is now on sale for $6.50), and check out their blog as they will be having more amazing guest bloggers and nail artist on there. 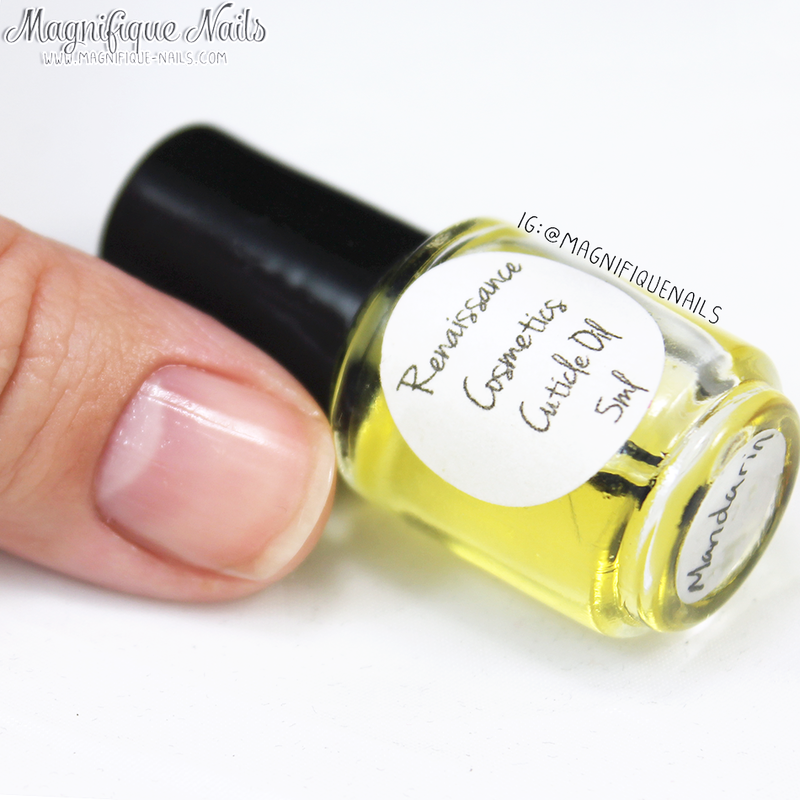 As for their cuticle oil, they come in 5ml for $3.00 and 10ml for $6.00.